Since Nate loves chocolate, we had a chocolate party for his 4th birthday which included a chocolate tasting and chocolate fondue. 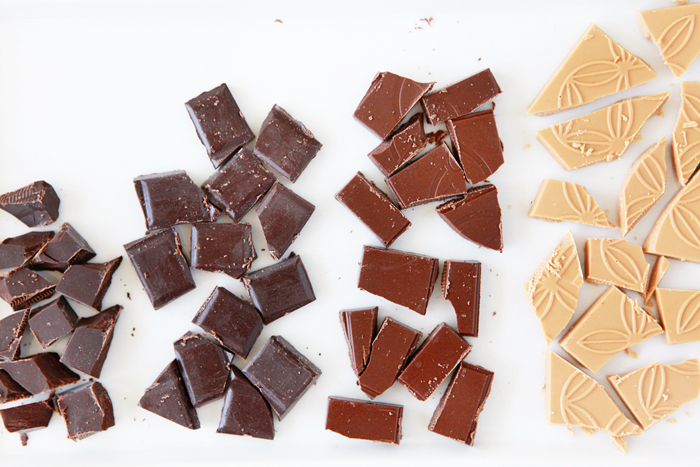 We nibbled on Woodblock Chocolate 70% Dark, Mast Brothers Maple Chocolate, Videri Chocolate Factory Dark Milk Chocolate and Fruition Toasted White Chocolate. We also had chocolate fondue and a salted caramel dark chocolate fondue with shortbread, Speculoos cookies and waffle strips for dipping (we used Julian’s Recipe Belgian Waffles). For the salted caramel dark chocolate fondue, I added a couple of tablespoons of Fat Toad Farm's goat's milk caramel and some sea salt to semi-sweet chocolate chunks, heated it up 30 seconds at a time in the microwave, stirring in milk later on to make the consistency smooth. The felt ball garland colors were originally inspired by a set at Hello Maypole, but I think they might have been sold out at the time, so I ended up purchasing a set of felt balls in the same colors from Benzie Design. One of Nate’s favorite gifts was a funny little donut cat (yes, exactly what you’re thinking!) from Etsy shop Marnin Saylor. 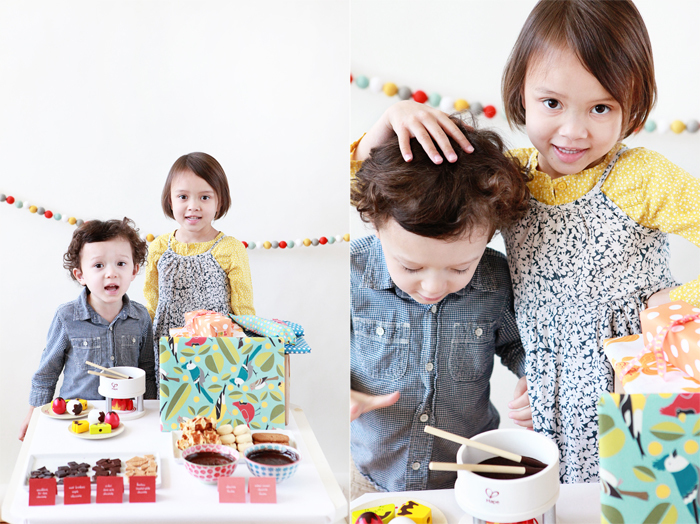 I also got this adorable pretend chocolate fondue set from Hape Toys for the party, which was a hit with Avery and Nate. Now they can have fondue whenever the mood strikes!